Spirit Cruises offers lunch and dinner cruises that feature dining, dancing and live entertainment, while cruising past the beautiful views of Washington, DC. While Spirit Cruises also operates the Spirit of Washington II (cruises to Mount Vernon) and the Capital Elite (private charters along the Potomac River), this review is of the Spirit of Washington, the newest ship in its fleet. Attire: Casual to dressy. No jeans, shorts or sneakers in the evening. Reservations: Call (866) 211-3811 or for a group of 20 or more, call (202) 554-8013. As you board the Spirit of Washington, the crew greets you and escorts you to your private table. 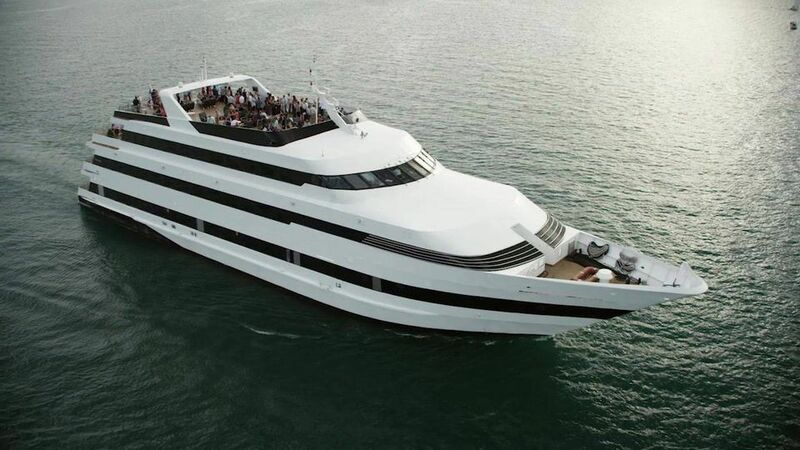 Although the ship holds up to 600 persons, it does not feel crowded because there are three decks with flexible seating for parties of two, four, eight and more. All three decks include full service bars, dance floors and buffets. One level can be rented out for a private party. The outdoor top deck offers fresh-air views with patio-style seating. Salad and bread are served at the table. Sodas or iced tea are complimentary. There is an excellent wine list as well as a full menu of creative frozen drinks and mixed cocktails. The main course is served by buffet. Your server tells you when it is your turn to go to the buffet, so the lines are are kept short. There is an assortment of meats, fish and vegetarian dishes as well as steamed vegetables, rice and potatoes. A choice of chocolate cake or cheesecake is served at the table with coffee. The highlight of the evening is the high energy live entertainment. Singers perform while roaming the floor. Following the meal, the entertainers sing and dance and lead line dances that get everyone up and dancing. The sound is kept at a reasonable level so that it never got too loud for conversation. The evening ends with the DJ playing a nice selection of dance music.